Old is good, especially when it's a freshly discovered newspaper from April 1929. It's exciting to read things that happened even before the stock market crash was to occur that coming October, leading America into one of the bleakest periods in our history. That sad period also saw the close of the oldest institution on the lower Mexican border: the Brownsville-Metamoros ferry. The ferry (chalon) was an efficient means of transportation between the U.S. and Mexico for 110 years, but in 1929, it took its last trip across the Rio Grande. No records exist of the very first ferry between Matamoros and Matamors Commons (now the City of Brownsville); it is believed to have occurred sometime in 1818, or about the same time as the founding of Congregation del Refugio. In 1826 when the Congregation del Refugio reorganized and took the name of Matamoros, the ferry was operating as the Anaquitas ferry to the Matamors Commons. It was at the site of this ferry that, in 1846, over 100 Mexican soldiers were drowned while retreating from General Zachary Taylor's soldiers. In 1850, Brownsville became the outfitting post for hundreds of goldseekers (and possibly gold diggers as well) headed for the gold mines in California. During the Civil War, thousands of bales of Southern cotton were brought through this port for shipment to Europe, millions of dollars worth of supplies for the Army of the South crossed at this point. After the Civil War when supplies for most of northern Mexico flowed through this port by way of Point Isabel over the Rio Grande Railway, the freight ferry continued to handle a "vast tonnage." An ever-growing population eventually replaced this historic ferry with a steel bridge. Today, the Brownsville-Metamoros Bridge is listed by Homeland Security as one of the prime land border ports of entry into the United States. Without knowing the history of these two great nations, we deprive only ourselves. Be sure to check out stories like this one when you plan your summer vacation. Old is good. "Ferry service along this stretch of the Rio Grande evolved as population in the area increased. In 1836, General Jose Urrea used rowboats at the Paso Real ferry near the later site of Fort Brown en route to Goliad. General Vicente Filisola used the same service on his retreat from the Battle of San Jacinto. Charles Stillman, a Matamoros merchant and businessman, and his estate owned most of the ferry operations near this site from about 1846. The three main ferry ports were located at newly emerging Brownsville, Anacuitas (also called Paso Libre, then Shannondale and later Freeport) and Mansfield. Brownsville and Matamoros were integral to one another and the ferries were a lifeline between them. During the Civil War, the Confederates used ferries to transport cotton to Mexico while southern ports were blockaded by the Union Navy. During Union occupation of Brownsville in 1863, the banks of the Rio Grande were teeming with families waiting to cross the river into exile in Mexico. 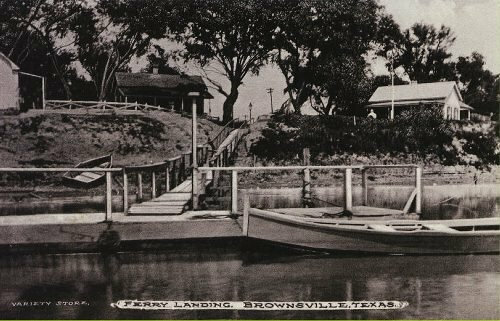 In the 1880s the ferry company built a plank walk from the railroad tracks to the Brownsville ferry dock because of complaints from passengers who had tired of walking through six inches or more of mud. The walk expanded as the ferry dock relocated several times, and soon the space was filled with a variety of shops catering to the bustling crowds of travelers. 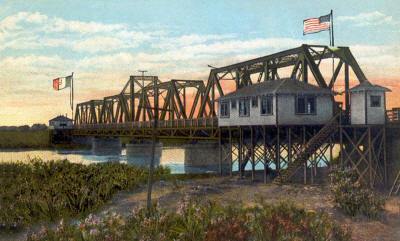 The Brownsville-Matamoros bridge was erected in 1910, but for a time only freight traffic on the river decreased. When the gateway bridge was built in 1928, the need for ferryboats vanished, and the boardwalk, by this time as much a part of local life as the river itself, vanished with them.